I'm particularly proud of my work last weekend for HockeyPrimeTime.com. 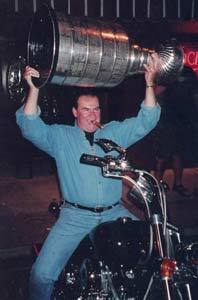 I wrote a brief piece on Pat Burns' impact on the National Hockey League's Northeast Division and my hockey fandom. Check it out and tell me what you think. He was easily my favorite of the Leafs. As news of Burns’ death spread Friday night, it quickly became clear I wasn’t the only one.